What does your resume look like? As the first impression you make when applying for a job, it needs to look clean and well-organized at the very first glance. More than 40 percent of hiring managers and recruiters claim they will automatically reject an applicant who submits a resume that has no organization or has a design that is too busy. They spend hours poring over hundreds of resumes, so the easier yours is to scan, the better your chances of receiving an invitation to interview. You can make your document easier on the eyes by presenting your information in a logical order, separating it with clear headers, and using bullet points that keep information concise. Our Word 2017 resume templates are an excellent starting point for anyone who is ready to create a more professional document, and will remain a standard for users of MS Word for the foreseeable future. Why Use Word 2017 Resume Templates? If you just want something that you know gets results, check out tried and true resume templates. These all-inclusive designs are some of the best from each separate category. Resume experts prepared each one with care and believe they work well for people in all types of careers and at all levels of experience. Each one is professional, organized, and eye-catching. If you are traditional or work in a conservative industry, basic and simple Word 2017 resume templates are likely enough to meet your needs. Basic templates are best for applicants who need something that is as easy to create as it is to read. These templates are also printer-friendly, which is helpful if you attend career fairs. Basic templates may be black and white or include pops of color. Combination Word 2017 resume templates are helpful for many applicants. These highly professional templates are perfect for people who want to change careers or climb the corporate ladder. They focus on strong skills and are a good match for people wishing to take on a senior executive position. Combination resumes take chronological and functional formats and create the best of both worlds. 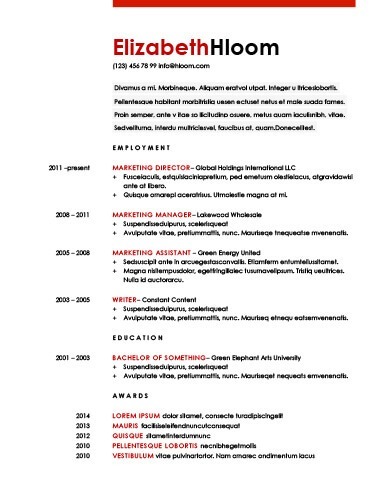 Achievements are a large focus of this resume style. Creative resumes have a small niche in the professional world but can be quite powerful when used correctly. Creative resume templates are a striking choice for jobseekers who work in such fields as advertising and marketing, graphic or web design, fashion, theater, or for startup companies. This type of resume focuses on color, graphics, and photos, all of which provide a way for applicants to show off their design eye while providing relevant information. Despite the many options available to you, there is still a place in the world for one-page Word 2017 resume templates. 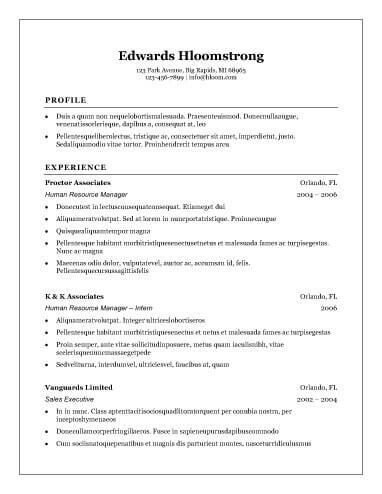 One-page resumes are perfect if you work in a conservative field such as finance. They are also helpful if you are applying for an entry-level position or a part-time job. One page is sufficient if you don’t have much work experience as well. Some employers even request just one page. Recruiters usually use the top one-third of your resume to determine if you’ll be a good match and decide whether to keep reading. Presenting the correct information in a logical order is essential when using Word 2017 resume templates. Use these tips and tricks to help you write your resume. Begin each bullet point with a strong action word, avoiding boring phrases such as "responsible for"
Provide relevant organizations, internships, and similar information, especially if it is very recent. Are you having trouble finding Word 2017 resume templates that fit your style? There is no need to worry. You might also consider using a resume builder. Builders allow you to fully customize your design as well as your content so that it feels more personal and fits your style. The provided guidance lets you know which kind of information to include and where to include it. There are other benefits as well.